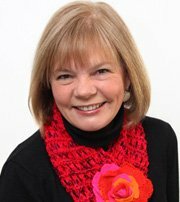 Interview With Knit-A-Square Founder Sandy McDonald | Nonprofit Advice! Sandy McDonald, co-founder and member of knit-a-square, provides some excellent advice on running a successful nonprofit organization in this informative interview. She also provides some great information on her organization and the excellent work that they are doing in Southern Africa. 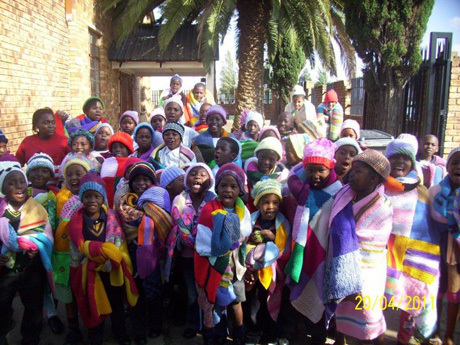 Knit-a-square and KasCare is a charity initiative that was started back in 2008. Since then it has been providing blankets, clothing, toys and stationary to aids Orphans in South Africa and other parts of Southern Africa. Its success has just grown and grown. Knit-a-square is a really great example of a successful non-profit organization and there are some great lessons to be learnt from its success! The great work it is doing in South Africa is truly amazing and inspirational and it was recently featured on ABC TV Australia alongside Nelson Mandela. Knit-a-square.com, the All For orphans' Blog, the Square Circle Forum and kascare.org, their formal website. She also runs her own personal website called whyyoumustblog.com, which is aimed at helping associations and businesses create their own communities online. You'll find a great video there about the power of blogging that uses knit-a-square as an example! Q1. 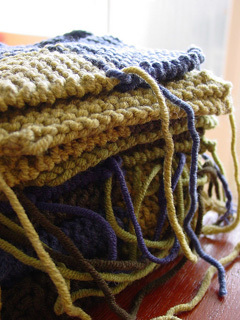 You started the knit-a-square project in 2008, where did the concept for this great idea come from? A. My aunt and co-founder, Ronda Lowrie, lives in South Africa and had visited us, here in Melbourne in June 2008. She told us that she frequently gave out cheap blankets to children she saw at traffic lights, especially on cold winter nights. The idea of cold children, many of whom may be orphaned and who were alone on the streets at night appalled us. Not long before that, my mother who is an avid knitter, had just given us a beautiful hand knitted blanket made out of squares. At much the same time I had been introduced to the online world and had been pondering what I could do usefully using some of the internet marketing strategies I had read about. The idea literally popped into our heads that we could create a new currency by asking the world's knitters to send 8" squares to South Africa to Ronda, who could sew them up into blankets for the children. We started the website knit-a-square.com believing at the time that it might result in Ronda receiving a few thousand squares over time. However, once we began to do the research, we found out that as many as 500 children a day were made vulnerable or orphaned as a result of HIV AIDS and poverty in South Africa. We began to understand the sheer scale of this mostly hidden tragedy. Our focus then shifted to really wanting to make a difference in these children's lives. Q2. How does knit-a-square work and how can someone participate in it? A. It is really simple; you just knit or crochet an 8" square and post it to South Africa. All the details are on the site. Our contributors can also knit hats and jumpers. We have a forum too in which any knitting and crochet queries can be answered and in which we run monthly challenges to excite the creativity of our generous KAS community. In addition, we ask people to 'spread the word' about the plight of the children and have provided the resources to them to make this possible. Q3. What has made knit-a-square and the KasCare charity so successful? A. A number of reasons have contributed to the way KAS has been successful. Firstly, we were lucky enough to stumble upon Site Build It! as the platform on which we built knit-a-square. By following the actions step by step, knitting and crochet folk found us quite quickly and warmed to the project and were extremely generous in their response. This is turn meant that we were spotted by a large USA Yarn company who wrote an article in their online magazine which went to a million knitters! That escalated our community very quickly as you can imagine. Secondly, we became very passionate about the cause and I think it showed in all of our communications with our community. We involved them every step of the way and were quick to invite people who showed real passion to join with us in growing the cause. These advocates for KAS have worked tirelessly to spread the word, keep the community engaged in making a difference in the children's lives and also in thinking of ways to keep the charity going financially. Lastly, we have been very concerned to show the results of everyone's hard work through our blog, http://allfororphans.com, and also through our regular eZine. 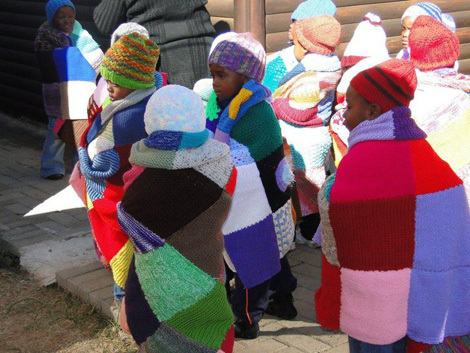 We send this out every 6 weeks with photographs of the children and their blankets, the work people do (some of it is so creative) and the wonderful volunteers we have on the ground in South Africa. Q4. In your opinion how important is it for a charitable organization to have a website, and how does a website contribute to the success of any charity and its fundraising campaigns? A. A website – websites actually - are absolutely essential for a charitable organization. We have four and each of them does a different job. Knit-a-square is there to find and invite knitters and crocheters to make squares and send them. The forum is there to keep our community growing and very actively engaged with regular challenges and activities. The formal website (kascare.org) is to provide us with a professional face for fundraising and allfororphans.com is really to grow our authority in terms of the AIDS orphan issue. A dynamic website, correctly positioned and well optimised for the search engines is the best possible way for a charity to connect with those who share its cause, and having done that to build relationships with them and to create an online community. Q5. What would be the piece of advice that you would offer to any charity that is starting up in terms of setting up and organizing their charity? A. Start with a website, and then move onto a blog. A blog is essential to dynamically communicate the issues surrounding your cause. Communicate with passion, in your own voice and use all the search engine optimisation traffic driving strategies you can, to find others who are passionate about your cause too. Look for the leaders within your growing community and invite them to join you in the cause and then give them the authority to act. Always act when you say you are going to, to keep building trust within your community. Be prepared to work unpaid for some time. This is the hard part and might not be the case for all start up charities. However, donor dollars are hard to come by and affected by major world catastrophes. We have made other plans to earn an income, while we continue to work for KasCare during the rest of our time. Q6. 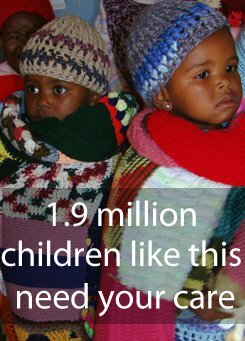 In terms of numbers and statistics how many children are you helping in Southern Africa and how many more still need your, and knitting worlds, help? A. Well to date we have received over 8500 knitted garments and about 125,000 squares which translate into around 4,000 blankets. We have also distributed thousands of other items, stationary, soft toys and rain coats. What we have discovered is that the blankets do more than warm the children, they bring hope. The volunteers and carers on the ground in South Africa are inspired by the generosity and kindness that comes from over 4,000 members in 35 countries. Our community is passionate about this cause and about KAS. They look out for one another. Participating schools, (we believe there may be as many as 250 schools internationally) report that the school children really respond to the idea that they are making a difference. The squares are truly a currency of hope. Q7. What are the plans for the future of knit-a-square and KasCare? A. We receive sufficient donations to ensure that the operations on the ground in South Africa can be paid for, although it still all happens out of Ronda's home (who, I would like to add, is an extremely important part of our charity). As our members grow (at about 30 a week), we receive more and more recurring monthly donations and in time, we hope to get a small warehouse and pay for an operations manager in South Africa. The early work we did on SEO (search engine optimisation) on the websites together with the various 'Spread the Word' campaigns we have and the Teacher Resource, KasKids, for the schools ensures that the community continues to build and the squares continue to be sent. We have recently started a KasElders program aimed at introducing into retirement homes around the world. Many reports suggest that knitting the squares is greatly beneficial for older women, particularly those who may have Dementia or Alzheimer's. We see this as a great testimony of the power of knit-a-square, that it helps both the maker and the recipient. We are incorporated in Australia but are in the process of incorporating in South Africa, which will assist us to raise additional funds. In the meantime, after two years of working unpaid, we have been forced to find other ways to earn an income, even though I continue to write and send the eZines and to drive the various programs... although not as quickly as I would like! I encourage everyone to please help this excellent cause by either knitting squares, or (if you don't knit like myself) send a donation! Any little bit will help out. You can donate by visiting knit-a-square... Where you will also find information on knitting squares and sending them to South Africa! Many thanks to Sandy McDonald for agreeing to do this interview and for the excellent information she provided within it.